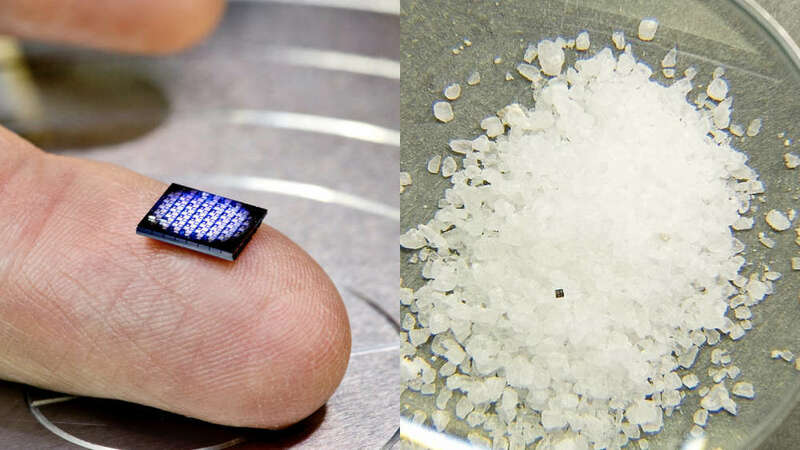 IBM World's Smallest Computer - "It's Smaller Than A Grain"
IBM’s “world’s smallest computer” is the size of a grain of salt. IBM is nothing if not ambitious. From using “crowdsourced supercomputers” to tackle climate change to trying to win the race in quantum computing, it’s always got one foot in the future – and, based on a new development first spotted by Mashable, that future is getting increasingly small. In a blog post uploaded in time for this week’s Think 2018, the company’s showy-off conference spectacular, the company has unveiled – in-between lattice cryptography and AI-powered robot microscopes – what they claim to be the world’s smallest computer. “Within the next five years, cryptographic anchors — such as ink dots or tiny computers smaller than a grain of rock salt — will be embedded in everyday objects and devices,” the post casually notes. The accompanying image showcases a series of 64 motherboards, and two separate record-breaking computers can be seen in the top-left corner with plenty of room to spare. So what exactly are they? Details remain fuzzy, but schematics show that it has a fully-fledged processor, memory components and up to 1 million transistors on a 1 x 1 millimeter-sized board. It’s about as powerful as a chip from the x86 family from 1990, which is pretty good considering those chips were magnitudes larger. The primary focus on these tiny computers and this section of the blog post isn’t its eye-catching dimensions, however, but protection from counterfeiters. Noting in an accompanying video that “fraud costs the global economy more than $600 billion a year,” IBM then talks about Blockchains. These are ongoing records or ledgers that, using complex cryptographic technology, record the who, when, where and what details of online transactions. Blockchain was originally used in bitcoin transactions to ensure their authenticity and security, and as noted by Fortune, diamond companies have been early adopters of the tech. This new miniature computer is designed to bring that technology into the physical realm. These hack-resistant fingerprints, also described as “crypto-anchors”, will be used to authenticate a product’s origin, contents, buyers, and sellers, much like a hands-on form of blockchain. Far from just stopping there, though, they also note that they’ve manufactured working crypto-anchors that take the form of edible ink, stamped on – for example – malaria pills to guarantee to the user that they’re not fakes. “Even liquids like wine can be verified,” they add. Forget the tiny computer chip, then. The future isn’t so much small as it is nearly invisible.